The material in this book was first presented as a one-semester course in Relia- bility Theory and Preventive Maintenance for M.Sc. students of the Industrial Engineering Department of Ben Gurion University in the 1997/98 and 1998/99 academic years. Engineering students are mainly interested in the applied part of this theory. The value of preventive maintenance theory lies in the possibility of its imple- mentation, which crucially depends on how we handle statistical reliability data. The very nature of the object of reliability theory - system lifetime - makes it extremely difficult to collect large amounts of data. The data available are usu- ally incomplete, e.g. heavily censored. Thus, the desire to make the course material more applicable led me to include in the course topics such as mod- eling system lifetime distributions (Chaps. 1,2) and the maximum likelihood techniques for lifetime data processing (Chap. 3). A course in the theory of statistics is aprerequisite for these lectures. Stan- dard courses usually pay very little attention to the techniques needed for our purpose. A short summary of them is given in Chap. 3, including widely used probability plotting. Chapter 4 describes the most useful and popular models of preventive main- tenance and replacement. Some practical aspects of applying these models are addressed, such as treating uncertainty in the data, the role of data contamina- tion and the opportunistic scheduling of maintenance activities. "...a welcome addition to the resources our profession possesses to learn from, teach from, and refer to...Overall, this is a wonderful book. The theory is sound, the examples are practical, real concerns are treated, and the exposition, although economical, is well organized and logically laid out...As a resource for self-study and as a reference for the professional, this book is an example for others to follow." 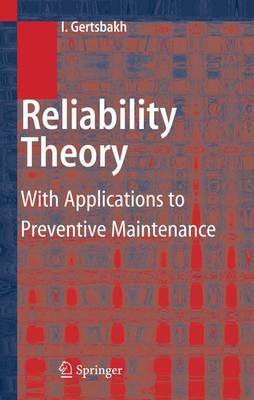 "This book gives a very concrete introduction to basic preventive maintenance policies in reliability theory. The material is presented in an elementary way which makes it accessible for readers with basic knowledge of calculus, probability and statistics. Each chapter is concluded by a series of problems with detailed solutions. Overall, the book can be used as an excellent master-level textbook in maintenance policy for graduate students in industrial engineering, operation research, applied probability and statistics...The book is quite nicely written...One special feature of this book is that it contains many interesting examples, which are used for illustrating the basic concepts and theory."